Two prizegivings were staged for Leg 4 of the Volvo Ocean Race, yesterday. The first was the public prizegiving at the Volvo Ocean Race Village, where the three podium place winners were welcomed on stage and presented with their trophies. Plus the winning crew from Groupama had the honour of being able to spray the audience, and themselves with champagne in the traditional manner. A few hours later in ‘The Cloud’, a temporary structure built to house thousands of fans for the 2011 Rugby World Cup, the formal prizegiving was held, with the podium place winners again being recognised, along with several other awards for the Leg. Frenchman Yann Riou won the Inmarsat Media Crew Member award on Thursday to wrap up a great day for Groupama that also saw them crowned Leg 4 winners and winners of the Abu Dhabi Seamanship Award. It’s the second time in four legs that the 38-year-old Groupama MCM has won the award, this time picking it up in recognition of his media work in the 5,200 nautical mile race from Sanya to Auckland. Particular highlights of Riou’s work included an interview with bowman Brad Marsh conducted halfway up the mast of Groupama and his stunning coverage of an on board drama 100 miles from the finish in Auckland. Groupama 4 crew discovered a leak in the bow and were forced to bale out frantically before locating the source and plugging it. Riou’s super cross media coverage captured the whole incident which very nearly sunk the French team’s hopes with the victory so close. ‘Yann was able to tell us the whole story through the good times and the bad,’ said Volvo Ocean Race MCM project manager Rick Deppe. Riou was presented with the award by Chris Lim, Business Development Manager for Inmarsat Marine. Hamish Hooper from Camper/Emirates Team New Zealand and Amory Ross from Puma Ocean Racing were also nominated, with Abu Dhabi Ocean Racing’s Nick Dana getting a special commendation. Groupama, led by Franck Cammas, were also awarded the Abu Dhabi Seamanship Award by Abu Dhabi shore team member Butti Al Muhairi in recognition of the way they dealt with a crack in the bow of their boat in the final stretch of Leg 4. 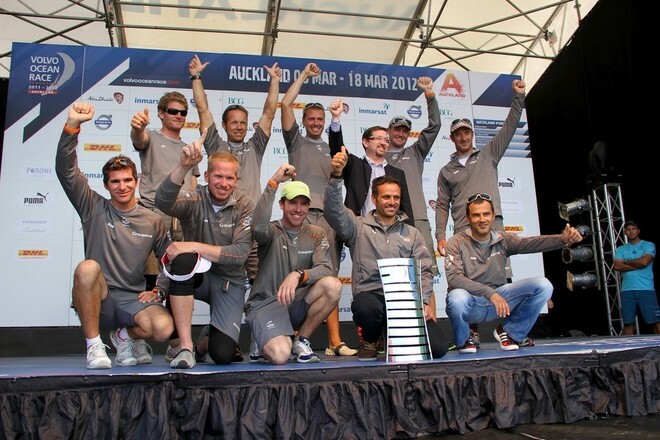 Earlier in the day Groupama were crowned winners of Leg 3 in front of a huge crowd at the Auckland Race Village main stage. Abu Dhabi Ocean Racing’s shore crew were awarded the DHL Shore Crew Award in recognition of the team’s professionalism and attitude after Azzam ran aground just before the Sanya Haitang Bay In-Port Race and Leg 4 start. Shore crew manager Mike Danks dived down to sand out two metre-long scratches to the keel bulb to ensure the boat didn’t have to be hoisted out of the water. The DHL Shore Crew Award was presented to Abu Dhabi by Gary Edstein, Senior Vice President, Oceania, DHL Express.